The Eck was the place to get a real fish fry dinner when I was a kid. The fame and popularity of the Eck's fish-fry extended well past its small town borders and patrons took numbers in order to be served on Friday evenings! Usually by the time it was our turn to be seated, we were about to faint from hunger, but it didn't matter - we would have waited even longer in order for our waitress to appear with the fish of choice - haddock. I can still picture the plates piled with thick pieces of crispy fish, golden fries, delicious coleslaw and crusty, French bread. If some people gave up meat on Fridays as a sort of penance, this was the way to go! For me, a fish fry dinner must come with fries and coleslaw, but I wonder where people get their recipes - did the actually taste the creation or did they just throw stuff together??? If a fish fry dinner has to have fries and coleslaw, the slaw has to have certain taste qualities for me to enjoy it. One thing - it can NEVER be made with Miracle Whip! Ugh. Fruit slaw is an especially refreshing salad with the inclusion of apple and pineapple. The pineapple is wonderful companioned with the cabbage and the unpeeled apple adds a satisfying, sweet crunch. I only use traditional-style, Hellmann's mayonnaise. I have tried their variations and do not care for the flavors. I do not consider Miracle Whip a true mayonnaise. Shred cabbage. 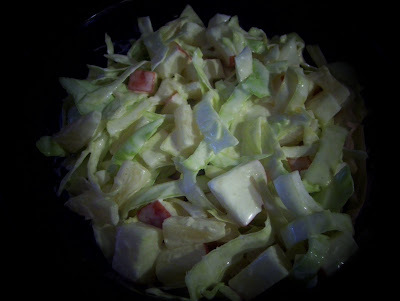 Mix mayo, vinegar, salt, sugar; toss with pineapple and shredded cabbage. Toss apple chunks with lemon and add to salad. Blend gently but thoroughly. Refrigerate. Makes 5 servings. Cathy wrote: I just want you to know how much I am enjoying your blog - - besides the recipes, of which most I have never heard of but can't wait to try - - - - you are a wonderful writer.